Have you noticed something different about Facebook posts from your favourite pages? 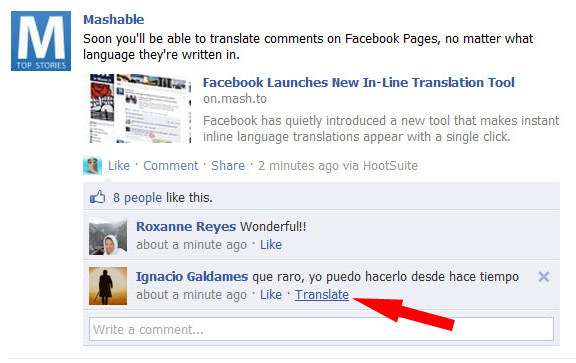 Facebook has quietly slid the Translate feature in to posts written in a language other than English. Now, you may see the option to translate the post, or comments if in another language, right next to the like and comment button. This is great if you know English, but I guess everyone else is out of luck for now until Facebook fully integrates the feature with their current platform, and works out the bugs. The translations are provided by Microsoft Bing, but are moderated by users. This means that bilingual users can enter a translation in that pop-out window. The human translations can be managed by page administrators using a “manage translations” link underneath posts on pages they manage. Try it out Here.